Compatible with Lowrance HDS Gen2 and Gen3 Chartplotter/Combination Units the Outboard Hydraulic Autopilot Pack with VRF (Virtual Rudder Feedback) is an affordable option. Steer to a Heading, Waypoint or Route with this Autopilot designed for single engine outboards up to 30’. 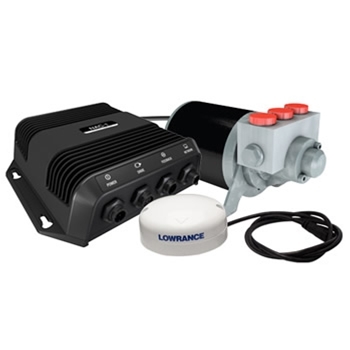 The Outboard Pilot Hydraulic Pack from Lowrance is an all in one Autopilot system for single engine outboards under 30’ in length. This hydraulic autopilot is complete and ready for most installations as it contains the autopilot computer, Hydraulic Pump that will be able to handle steering cylinder capacity of 14 ci, Point-1AP Heading and GPS Sensor, hydraulic fitting kit, and an Auto/Standby Button. Installation is an easy plug and socket connection to the HDS Gen 2 and Gen 3 plotters. With its virtual rudder feedback the Outboard Pilot from Lowrance also simplifies installation by eliminating the need for a rudder position sensor. Lowrance has incorporated a feature called SmartSteer into the Outboard Pilot allowing it to be used with the outboard engine on the boat but also a MotorGuide Xi5 Pinpoint electric-steer trolling motor. Operation of the Lowrance Outboard Pilot is easy as well with a one touch route creation tool that allows you to create a route from saved trails with one touch. With the Outboard Pilot Hydraulic Pack from Lowrance you will be able to steer your outboard motor to a heading, waypoint, route or cursor, with control from your HDS Gen2 or Gen3 display, and at a price that most fishermen will like. *** Depending on Steering type some additional hoses and fittings may be necessary. Each Hydraulic Autopilot comes with:NAC-1 Autopilot Computer, Pump-1 For Outboard Pilot, NMEA2000 Starter Kit, Point-1 GPS Antenna, Pump-1 Fitting and a Two-Year Limited Warranty. The Lowrance WR10 Wireless Remote provides you the ability to take control of your autopilot from anywhere on your boat with this easy to use, pocket size, wireless remote controller. Includes BT1 Bluetooth Base Station.